I installed an accessory bar to hold my Acorn Bag, Light, and Air Horn. 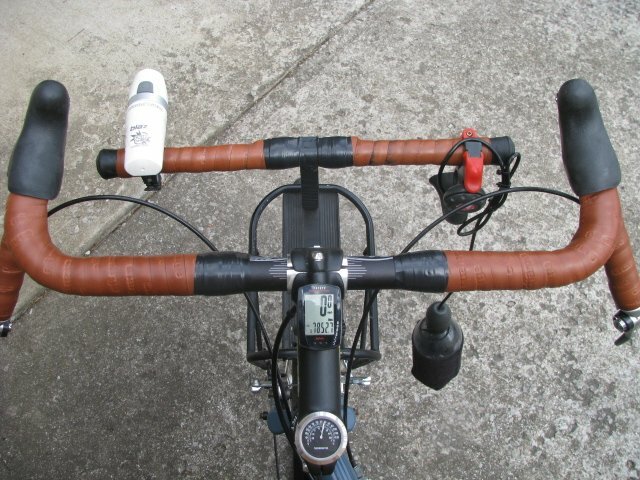 I like that those items are out of the way maximizing my hand positions on the handlebar and the Air Horn is really handy.. although it is somewhat annoying but great to make yourself known in traffic. 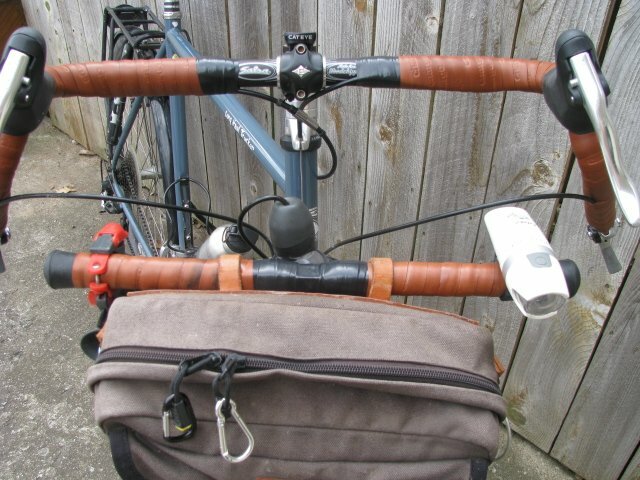 Okay, I realize that my LHT is not a streamlined go fast bike... and the accessory bar really makes that point, but I just relax, and make myself comfortable when touring. 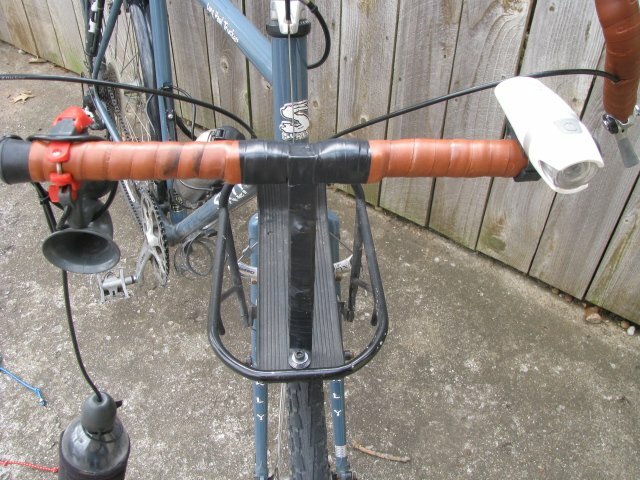 The recent change to the Salsa Woodchipper handlebar gave me the opportunity to change the accessory bar. I had the original accessory bar mounted to the stock LHT handlebar in the drops. 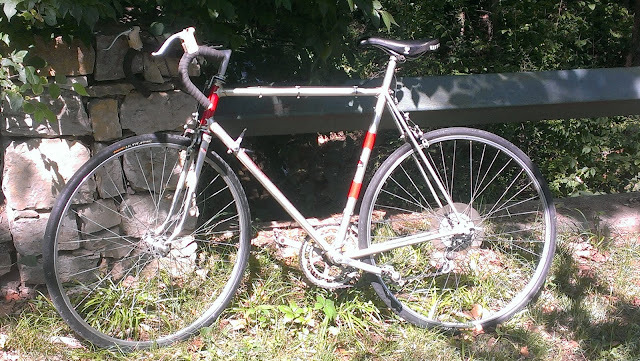 It worked well there for a couple of years (7,500 miles or so). But the new Woodchippers are wider and the accessory bar did not fit the same way. I needed to start over. 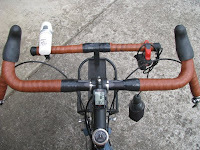 I took my old accessory bar (which is a inexpensive PVC irrigation riser tube) and attached a light weight builders "T" (a small bolt, electrical tape and handlebar wrap tape). The bottom portion of the "T" is bolted to a "L" riser. 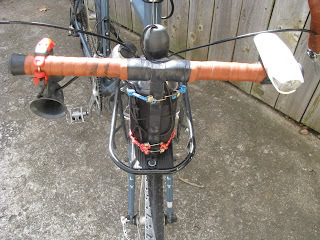 The "L" riser is bolted to the Front Bike rack. The "L" riser is a bit more substantial then the builders "T" but bolted together it is quite rigid. The air bottle to supply air to the horn is strapped to the riser with a couple of straps. This is a handy way to have the bottle stored. It sits nicely between the two pouches on the Acorn Bag. So far the bar holds the bag with load well . But only about 100 miles on it thus far. It seems very rigid with little vibration. Time will tell if this mounting system will work well over time. Having it sure frees up the hand positions on the handle bar. With the accessory bar toward the front of the rack, there is room still on the rack for other gear... like the sleeping bag. I have had a few requests to show how the bar is built and attached. I hope these pictures helped explain it. It is a inexpensive way to add room for those accessories!